Successfully Added Innokin Kroma Box Mod Kit - Sub-Ohm, 6 To 75W, TC, VV/VW, 510 Thread, 2000mAh, 2ML SlipStream Tank (Silver) to your Shopping Cart. 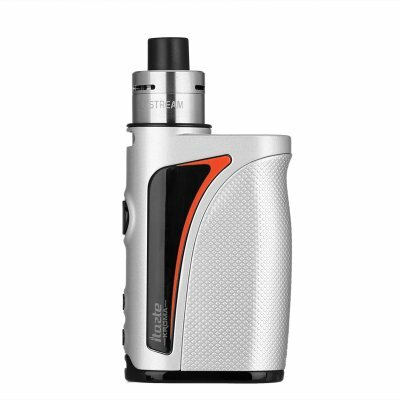 The Innokin Kroma is a sophisticated 75W box mod kit that comes with all the parts and tools needed to simply assemble your own high-end e-cig. Crafted out of durable and tough zinc alloy and stainless steel materials – this electronic cigarette can be efficiently carried along in your bag or pocket without you needing to fear of damaging it. Its compact rebuildable design does not only make this e-cigarette extremely portable, it also allows you to rebuilt it and attach different tanks and atomizers to its box mod – letting you personalize your e-cig to meet your personal vaping demands. With its 510 thread, this vape mod kit is compatible with nearly any RTA out there – bringing along an abundance of customization features and possibilities. With a power output of 75 Watt, this electronic cigarette is perfect for advanced vapers and beginners alike. Whether you’re looking for a way to upgrade your current vape experience, or are new to the industry and wish to start vaping in order to leave behind those harmful tobacco cigarettes – the Innokin Kroma box mod kit is sure to meet your demands. Featuring a lightweight yet powerful 2000mAh battery, this e-cigarette packs plenty of juice that allows you to get through multiple of vaping sessions without needing to worry about battery life. Simply attach your RTA to your 75 Watt Box mod, fill up its tank with your favorite tasting e-liquid, and you’ll be all set to enjoy a relaxing vape at any given moment. The rebuildable tank that this vape box mod comes with features a decent 2ml capacity – allowing you to fill it up with plenty of vape liquid. With its adjustable temperature feature, this electronic cigarette furthermore lets you manually adjust the temperature between 150 to 315 degrees Celsius thanks to which it allows you to customize your vape experience to your own personal liking. Additionally, this box mod kit is capable of holding different coils and supports an Ohm resistance ranging from 0.1 to 1.0-Ohm, further allowing you to personalize your vape experience by letting you choose the amount of taste and vapor created with each puff you take. Within its durable body, the Innokin Kroma 75W electronic cigarette holds a smooth OLED display on which it constantly portraits the current settings enabled on your e-cig. From now on you’ll always be sure to have the right settings enabled to enjoy your vaping sessions in the way you like most as, with this OLED display at your disposal, you can’t go wrong. Perfect for any type of vaper out there, this Innokin e-cig is a vaper that is guaranteed to meet all your personal vaping demands. The Innokin Kroma comes with a 12 months warranty, brought to you by the leader in electronic devices as well as wholesale electronic gadgets..